The older kids were all with grandparents during our stay at the hospital and I think they had more fun than they ever have at home! They spent our labor and delivery day with Papa Steve and Grandma Tanya. Olivia made me a vegan chocolate cake, complete with chocolate frosting, and even pretty pink bracelets were made for the girls, their new sister, and a pretty green and brown one for mommy. 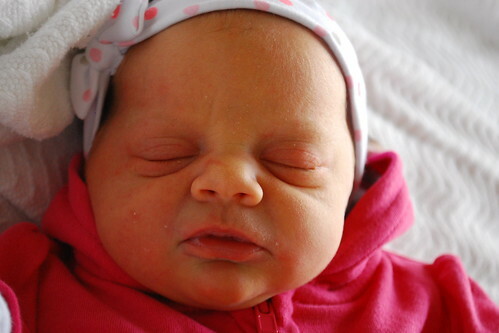 They came to visit their new sister the day she was born, I posted those photos yesterday. After their visit they headed to Papa Todd and Mimi’s house. My mom sent me these photos from her phone to show us what they had been up to. Meet the chickens. Apparently the chickens were a huge hit during the kids’ visit. Rachael enjoyed chasing them around and was always asking my mom questions… like whether or not they would eat her. 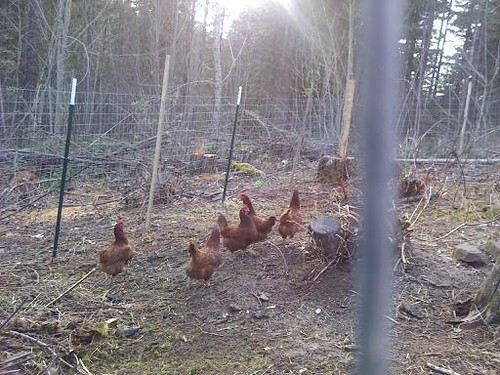 And of course, with chickens… come eggs! These were the first eggs found by the grandkids – as you can see, they’re thrilled. I have no doubt that over the course of their stay they probably ingested about 2 dozen eggs a piece. My mom’s a practicing food pusher… aren’t you, Mom! 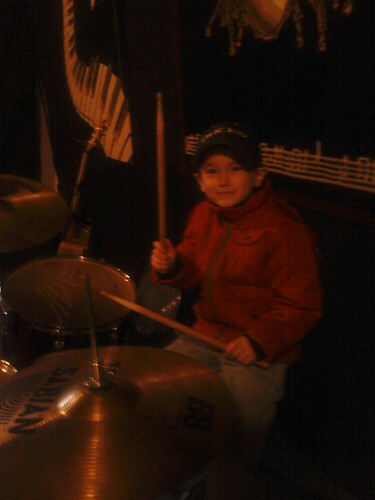 Duncan got to take a turn on the drums – no more practice pad when you’re at Mimi’s! He and Olivia have started a band (which she now denies) in which he plays drums, Olivia does vocals and both let their younger sister sing from time to time. But only the classics like Itsy Bitsy Spider and Twinkle Twinkle Little Star. Duncan enjoys composing as well, his latest hit is “Bang It Now”. The kids also got to come back the next day with Papa Todd and Mimi to visit again! 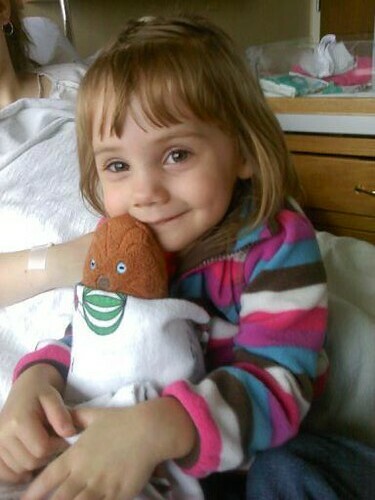 They’re so sweet with little Charlie, she is very loved. 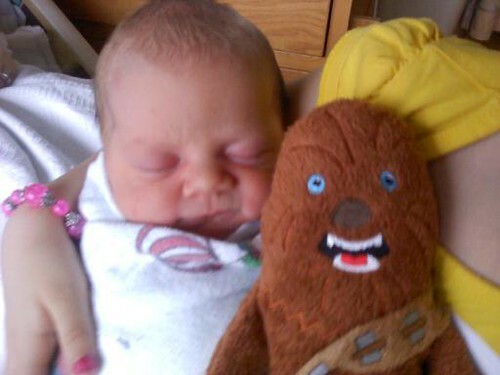 Rachael loved swaddling Chewy up in a hospital blanket, just like Charlie was. 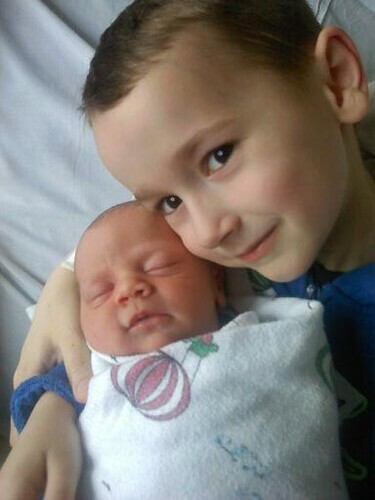 Duncan & Baby Sister – he is such a cuddly boy to begin with, but when he laid eyes on this brand new baby sister it was like a whole new world of cuddling opened up to him. The boy is consistently sucked onto his sister, whether he’s kissing her head, holding her hands, patting her back, playing with her feet… you get the idea. The next day we were finally ready to head out and bring Chuck home. 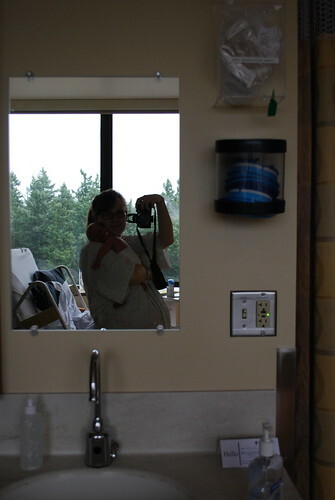 As you can see, she was thrilled… gotta love that brand new baby stage where as long as they’ve got milk and warm blankets, they couldn’t care less about where they are or what’s going on in the background.